Carbon Capture and Storage (CCS) has been receiving an unprecedented amount of media and scientific attention since the publication of The Stern Review on the Economics of Climate Change in 2006. The global energy supply is characterised today by structural weakness and geopolitical, social and environmental shortcomings, particularly as regards security of supply and climate change. Energy is the major determinant of economic growth and deficiencies in the energy supply can have a direct impact on growth, stability and the well-being of every citizen. With that in mind, it is imperative that fossil fuel will continue to be used for the foreseeable future. Power plants have to be equipped with CCS facilities in order to mitigate climate change while providing energy to power the economy. Carbon in CCS refers to Carbon Dioxide. 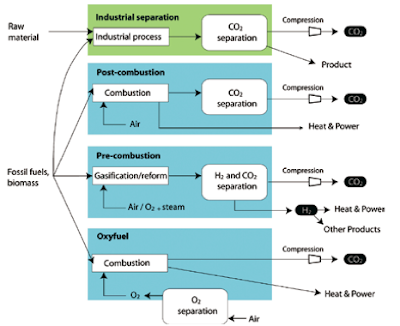 Industrial Carbon Capture Strategies are divided into 4 categories: Industrial Separation, Post-Combustion, Pre-Combustion and Oxyfuel Combustion. These strategies assume zero sulphur content as desulphurisation is employed in processing coal, gas and biomass prior to utilising them as fuel. It is crucial that the captured carbon dioxide is free of moisture and oxides of sulphur and nitrogen. This is to minimise corrosion of the pipelines that will transport the carbon dioxide to geological storage. Carbon Dioxide has been captured in industrial processes for many years. Most of the Carbon Dioxide captured, however, is vented to the atmosphere because there is no incentive or requirement to store it. Current examples of Carbon Dioxide Capture in industrial processes include sweetening of natural gas and the production of synthesis gas for the manufacture of ammonia, alcohol and synthetic liquid fuels. Chemisorption of Carbon Dioxide via a base (e.g Monoethanolamine) is usually employed. Carbon Capture from flue gases produced by combustion of fossil fuels and biomass in air is referred as post-combustion capture. Instead of being discharged directly into the atmosphere, the flue gas is passed into a chemical separation system in which most of the carbon dioxide is captured. The remainder flue gas is then discharged to the environment. Pre-combustion capture of Carbon Dioxide involves gasification, in which the fossil fuel reacts with air and steam to produce Synthesis Gas (a mixture of Carbon Monoxide and Hydrogen Gas). The carbon monoxide in Synthesis Gas then reacts with steam in a Shift Converter to produce Carbon Dioxide and Hydrogen. Pre-combustion systems produce a hydrogen-rich fuel is then used to generate electricity via combustion or fuel cell. 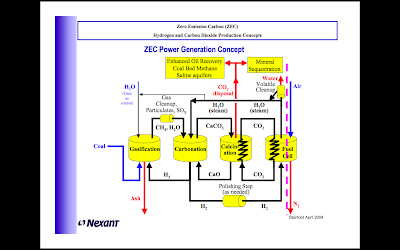 An example of pre-combustion Carbon-Capture Energy Generation System would be the ZECA Process. Oxyfuel Combustion employs using near pure oxygen to burn fossil fuels or biomass instead of air. This results in a very hot flue gas rich in carbon dioxide and water. To moderate temperature, some of the flue gas is recycled into the reactor. 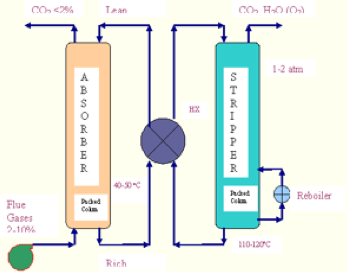 Oxygen is usually produced by low temperature (cryogenic) air separation and novel techniques to supply oxygen to the fuel, such as membranes and chemical looping cycles are being developed. A recommended methodology employed in selecting what carbon capture technology to use would be the Environmental Assessment and Appraisal of Best Available Technology (BAT), stipulated in the Integrated Pollution Prevention and Control Directive of the European Commission. On top of assessing the environmental impacts of the different technologies, key criteria such as the concentration of Carbon Dioxide, the pressure of the gas stream and type of fuel used have to be taken in account too. Figure 2: (a) CO2 post-combustion capture at a plant in Malaysia. This plant employs a chemical absorption process to separate 0.2 MtCO2 per year from the flue gas stream of a gas-fired power plant for urea production (Courtesy of Mitsubishi Heavy Industries). (b) CO2 pre- combustion capture at a coal gasification plant in North Dakota, USA. This plant employs a physical solvent process to separate 3.3 MtCO2 per year from a gas stream to produce synthetic natural gas. Part of the captured CO2 is used for an Enhanced Oil Recovery project in Canada. Carbon Capture Systems consumes energy. This means power plants with CCS have to produce additional energy for capturing Carbon Dioxide, as a result the cost of electricity generated for sale increases. The increment in cost of electricity is tabulated in Figure 3. It is clear that the cost of electricity increases by approximately 33% due to CCS. Therefore, it is essential that CCS systems should energy efficient and not energy intensive in order to reduce the cost of electricity and to alleviate fuel poverty. Although no carbon capture system is required for oxyfuel combustion, obtaining near pure oxygen for fuel combustion is energy intensive. 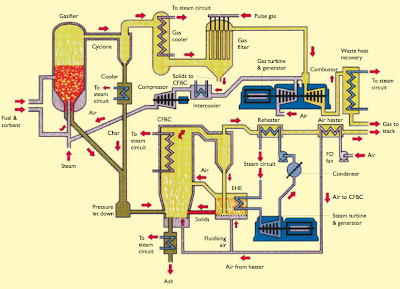 Currently, cryogenic separation of air is used to obtain oxygen for oxyfuel combustion. The flue gas from oxyfuel combustion is rich in Carbon Dioxide and moisture. Moisture has to be removed from the flue gas before transporting. The most common form of carbon capture technology is the sorbent/solvent system. Carbon capture is achieved by contacting the flue gas with a liquid absorbent or solid sorbent that is capable of capturing carbon dioxide. Monoethanolamine is commonly employed as the liquid absorbent. Lime (CaO) is a substance that can potentially act as a solid sorbent. In the general scheme, the sorbent loaded with the carbon dioxide is transported to another vessel whereby the Carbon Dioxide is released (either via heating or pressure changes). In this way, the sorbent is regenerated and can be transported back where it is contacted with the incoming flue gas to absorb Carbon Dioxide. This approached is adopted in industrial processes, post-combustion capture. Figure 4: Carbon Capture via Chemisorption of CO2 using Monoethanolamine (MEA). CO2 is released by heating rich MEA, thus regenerating the lean MEA solution. HX refers to heat exchanger, which transfers heat from the lean MEA solution leaving the stripper to the rich MEA solution leaving the Absorber. The challenge with this technology is ensuring high carbon capture rate and reducing energy intensity. In Figure 4, heating the rich MEA solution in the Stripper regenerates lean MEA. This is energy intensive, given the volume of MEA in the system. The MEA solution must be sufficiently lean to maximise Carbon Capture. Moreover, the carbon capture rate can be maximised by maximising the contact area between the sorbent and the flue gas in the Absorber or increasing the residence time of MEA in the Absorber. An approach in maximising the contact area is to use Bubble Pack Column instead of a traditional stage column. Heat integration is key in reducing the overall energy intensity of this Carbon Capture technology. Membranes are specially manufactured materials that allow selective permeation of a gas through them. 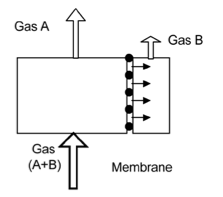 The selectivity of the membrane to different gases is intimately related to the nature of the material, but the flow of the gas is usually driven by the pressure difference across the membrane. High pressure streams are usually preferred for membrane application. There are many types of membrane materials, such as polymers, metals and ceramics. Although membrane separations finds many current commercial applications in industry, such as the sweetening of natural gas, they have not yet been applied for large scale and demanding conditions in terms of reliability and low cost required for Carbon Capture. However, membrane separation is the preferential process for extracting hydrogen from a fuel gas stream. Membranes have been used in isotope separation, with specific application in uranium enrichment. It is only in recent years that membranes have found use outside the nuclear industry. Pre-combustion capture of Carbon Dioxide is a relatively new concept. It is based on the steam reforming of light hydrocarbons, otherwise known as Gasification. Gasification is the conversion of a carbon-containing solid or liquid substance into a gas in which the major components are Carbon Monoxide and Hydrogen. This gas is known as Synthesis Gas. Synthesis Gas can either be used as a fuel or a chemical feedstock which products such as Ammonia and Methanol are made from. The defining chemical characteristic of gasification is that it entails the partial oxidation of the feed material. In combustion, the feed is fully oxidised, whereas in pyrolysis, the feed undergoes degradation in the absence of oxygen. The oxidants for gasification are oxygen, air and steam. Steam also acts as a temperature moderator as the reaction of steam with carbon is endothermic. The choice of air or pure oxygen depends on a number of factors, such as the reactivity of the feed material, the purpose for which the gas is used and the type of gasifier. For example, the Shell Middle Distillate Synthesis uses air to partially oxidise Natural Gas to produce Synthesis Gas for the manufacture of Synthetic Diesel. In the ZECA Process, steam and hydrogen are used to gasify coal to create more hydrogen gas for power generation in a Proton Exchange Membrane (PEM) Fuel Cell. Currently, IGCC power plants uses Gasification to generate power from coal, heavy oil residue and waste wood. Coal is first gasified in the Gasification Reactor using Hydrogen Gas. Light hydrocarbons in the matrix of coal is also released in the Gasification Reactor. The light hydrocarbon and the synthetic methane is then passed into the Carbonation Reactor. They react with steam in to produce Carbon Dioxide which is absorbed by Calcium Oxide (Lime). Calcium oxide is converted to Calcium Carbonate. Calcium Oxide is regenerated using the waste heat from the fuel cell. Hydrogen gas is generated in the Carbonation Reactor. For every mole of Carbon gasified, 2 moles of hydrogen gas are consumed and 4 moles of hydrogen gas are generated is the Carbonation Reactor. There is a net gain of 2 moles of hydrogen gas per mole of Carbon consumed. Carbon Dioxide is captured before the oxidation (or “combustion”) process.